Wildflower seed by wildlife preference. Wild animals and insects all have a favorite plant or type of plant they prefer to feed on, use for shelter or raise their young. Butterflies tend to prefer flowers with a flat top where they can perch and feed. By flat top I mean more like what you would see on sunflowers or cone flowers. They also like clustered flowers such as what you see on a butterfly bush. In fact this is the perfect name for this bush. Mine are covered in butterflies from the first bud to the first freeze and they bloom all summer long. Butteflies are also very attracted to thistle. One nasty, and painful plant, with a strangely pretty purple flower on top. Go figure. Butterflies also love blossoms colored in red, yellow, purple and pink. For a better butterfly turnout pick a sunny place. Also be aware that catterpillars also require the right food in order to turn into butterflies. Unfortunately each species can be very picky about the plants they choose to eat, so to make a place for caterpillars will require a little more research and deciding which butterflies you'ld like to have around. note - Instecticides in the garden will kill butterflies even though they were meant for other bugs. To attract hummingbird you will have to add some other wildflowers to your garden. 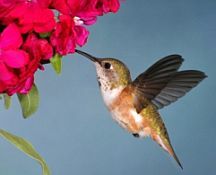 Hummingbirds prefer long, tubular flowers, shaped more like a trumpet. These are the flowers hummingbirds like to hover over and poke their long beak and tongue down into to lap up the nectar. Flowers prefer this mode of pollination, because they usually brush their pollen off on the bird's head as it feed and the deep trumpet hape protects the nectar just for the hummingbird, keeping out marrauders that might eat the nectar without picking up the pollen. Fortunaly hummingbirds aren't so picky thatthey might ignore all else for just these flowers. They also enjoy the clustered flowers that the butterflies like. There are dozens of species of wildlife you can consider attracting to you garden. Hummingbirds and butterflies are just the ones that people enjoy watching the most. However, your garden will attract other insects which will in turn attract animals like frogs and toads or dragonflies. Any cluster of flowers will undoubtedly attract bees so be aware of this when choosing location, especially if anyone in the household should have allergies to bee stings. That said, bees can be a delight to observe as well. I especially love those plump bodied bumble bees, that rarely sting a human unless provoked. But the list doesn't necesarily end there. Your garden may attract turtles or other small birds. Don't worry yourself too much about preferred rain garden plants and wildlife. The rain garden by nature is a small native habitat and this website has long lists of wildflowers and other plants that will make a paradise for native species. What's even better is that these plants will grow year after year. No replanting, unless you just want to add some new wildflowers.